If you squint and stand back, perhaps, it could look like a bona fide Banksy. It is a Wednesday morning on Portstewart's cliff walk and a small gathering of locals are peering at the County Londonderry town's latest piece of street art. What appeared on the back wall of the Dominican College overlooking Portstewart's rolling spiked dunes, is in the Banksy-style. It's not unlike the secretive artist's famous Slave Labour or No Ball Games. 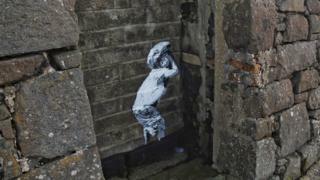 Portstewart's newest graffiti depicts a young boy crouching with his hands over his eyes. Has Banksy left his mark in Tokyo? Is he playing hide and seek? Or is it something more sinister? Either way, this anonymous street art has people talking. Richard Stewart, owner of Molly Brown's Tea Room and Mullins Ice Cream on Portstewart's promenade, first heard about the town's new Banksy-style graffiti online. "It started appearing on Facebook and on other social media. People were asking: 'Have you seen this? '," he said. Image caption Richard Stewart said that people are visiting Portstewart in search of the "Banksy"
"There's a lot of people coming from all over Northern Ireland and even further afield," he said. Michael Hughes, owner of the Portstewart Galleries, said he was alerted to the new 'Banksy' when people started to appear in the gallery asking: "Is it real?" A Banksy or a copyist? Mr Hughes took it upon himself to see this so-called Banksy for himself - and while he "doesn't know whether it's a Banksy or not" he said it's a nice piece of art regardless. Indeed, this is not the first Banksy-like street art to appear in Portstewart. Only a few metres before the cliff walk, there's another piece of a child cowering. Other social media posts of these pieces in Portstewart date back as far as 2014. Julie-Anne Richmond, a local artist, said there are some important signatures to look out for if it was a Banksy. "If you look at a lot of his other work it doesn't include the feet," she said. "On this piece, the blacks aren't as full, perhaps. But it's similar to some of the pieces he's done of the children." She too thinks it is a nice piece of work, even if she does not believe it is a Banksy. "People who don't know anything about art or who haven't got an interest in art, they've heard the buzz and they want to know who Banksy is," she said. "People who normally don't bother with galleries or art work are now thinking, 'I want in on this action'." Whether or not it is a Banksy hardly matters if it brings people into the town, said Mr Stewart. "Americans who were doing the Game of Thrones tour were close by and they searched towns in their surrounding area and the first thing that came up was 'Portstewart' and 'Banksy'. "It's good for traders," he said. But Francis Scullion, owner of Cochrane's Footwear in Portstewart, said that while the new art has created a bit of buzz, it is hard to tell whether it brings more business to the town. Walking down the stone steps back towards the promenade, Mr Hughes said he hopes the art is maintained. "There's a clear groundswell of opinion in the town that the council should put something over this to protect it," said Mr Hughes. A spokeswoman for the Causeway Coast and Glens Borough Council said that the council has "received no correspondence in relation to this matter". If Banksy were to visit Northern Ireland, Mrs Richmond said she would be intrigued to see his take on the political situation here. "Banksy has no fear and no qualms about speaking about his political views," she said. In fact, Mr Hughes said he would welcome Banksy to Portstewart himself. "Would he please put something on the shutter of my gallery? Please feel free to use that. "I'd get something like £3.4m for a shutter like that," he said.